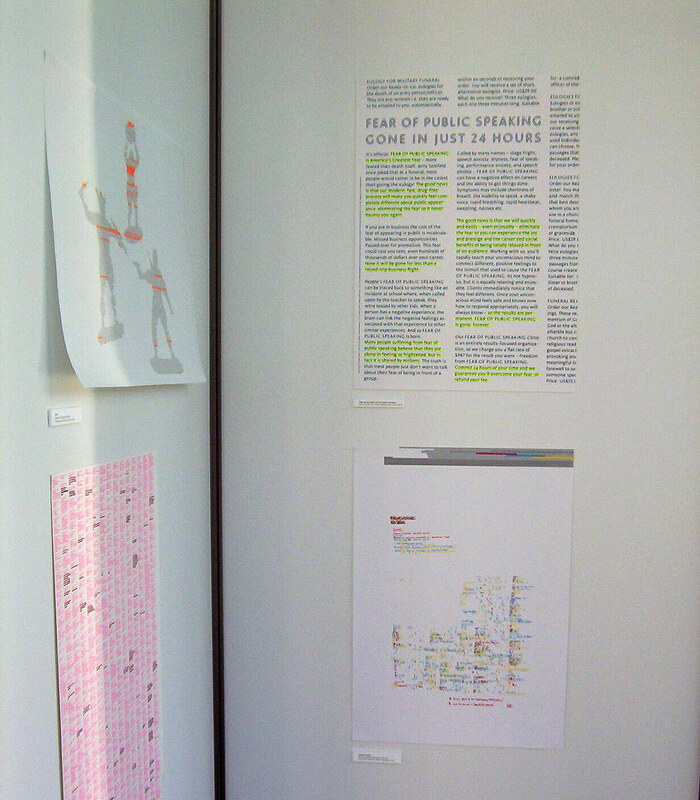 Public Address System – Typographic Interpretations of Historical Speeches (Berlin), exhibition and book curated by Angharad Lewis, Grafik magazine, London, UK. 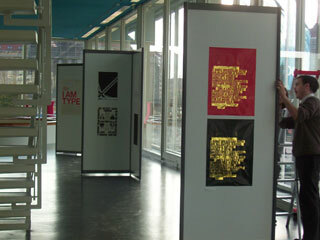 Exhibited as part of the GraficEurope conference 2004 in Berlin, Germany. 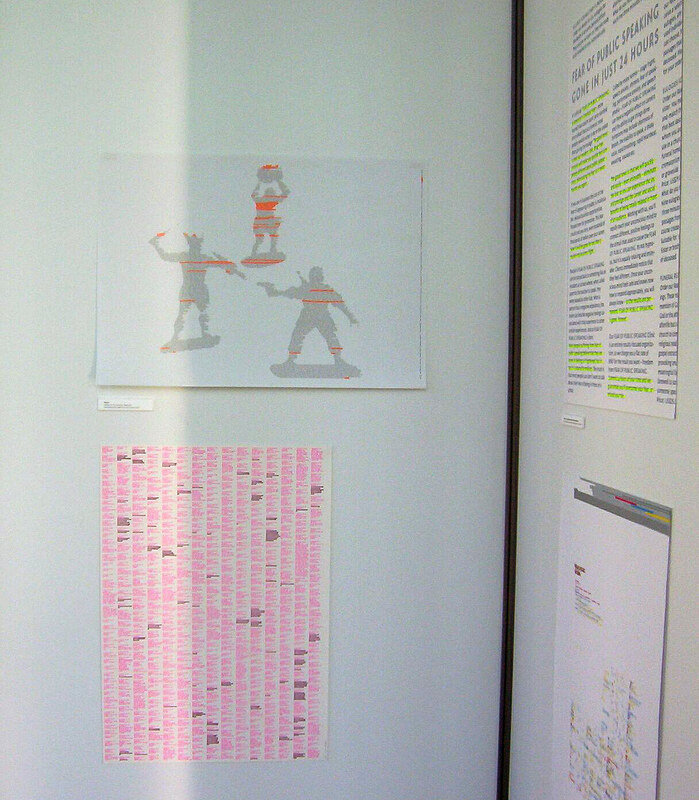 FL@33 was also nominated to be part of the Emerging Designers 2004 exhibition at the GraficEurope conference, shown at the same occasion, 14–16 October 2004. See also: Public Address System (London), Henry Peacock Gallery, London, UK, 9 January – 15 February 2004. 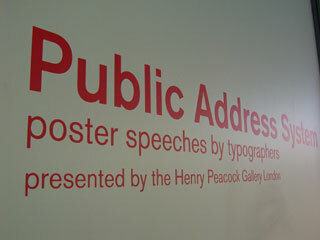 FL@33 was invited by Henry Peacock Gallery and Grafik magazine to contribute one typographic A2 poster for the exhibition Public Address System (London) – 40 typographic interpretations of historical speeches. ___ FL@33's contribution interprets a speech by His Holiness the Dalai Lama addressing the European Parliament in October 2001. 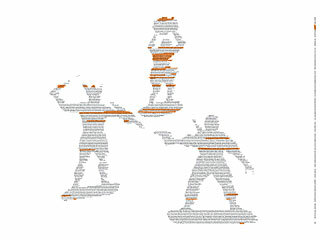 The typographic illustration represents a Mexican standoff with three warriors of different time periods threatening each other – a thought-provoking visual to compliment the core message of the speech on Dalai Lama's non-violent struggle for world peace. 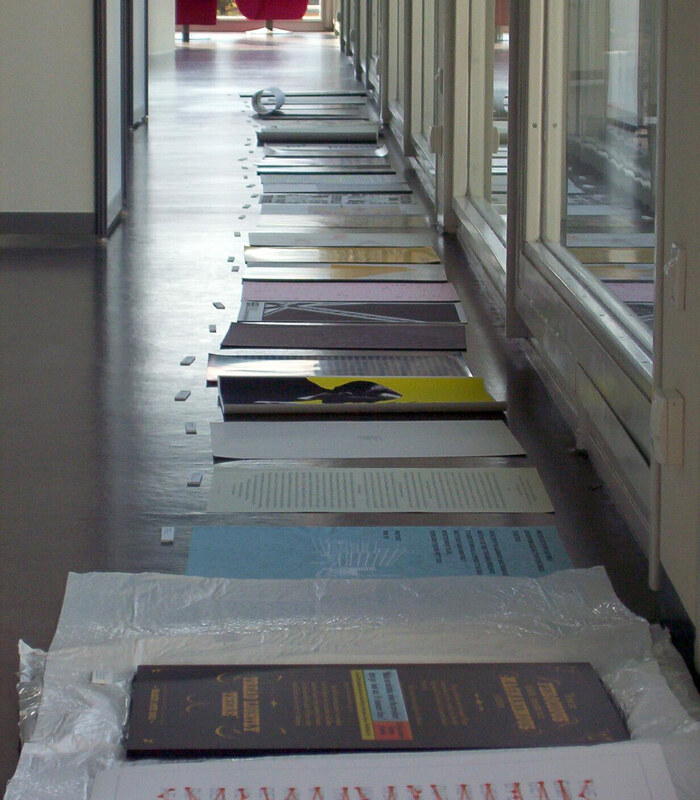 ___ The exhibition poster Dalai Lama Speech was printed in a limited, hand-numbered edition of 300, black and fluo orange (Pantone 804). 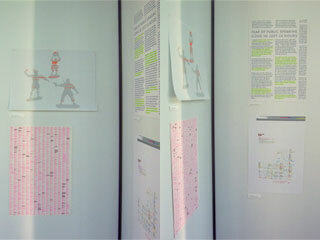 See bigger pictures of the poster on its project page. 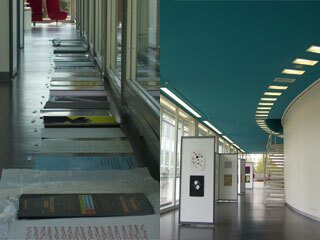 There was the original launch exhibition in London and a second one – shown here – that took place in Berlin later that year as part of GraficEurope conference 2004. The book Public Address System – Poster Speeches by Typographers by Angharad Lewis, Harriet Warden, Thom Winterburn and Paul Finn was published in November 2006 by Images Publishing Group, Victoria, Australia. 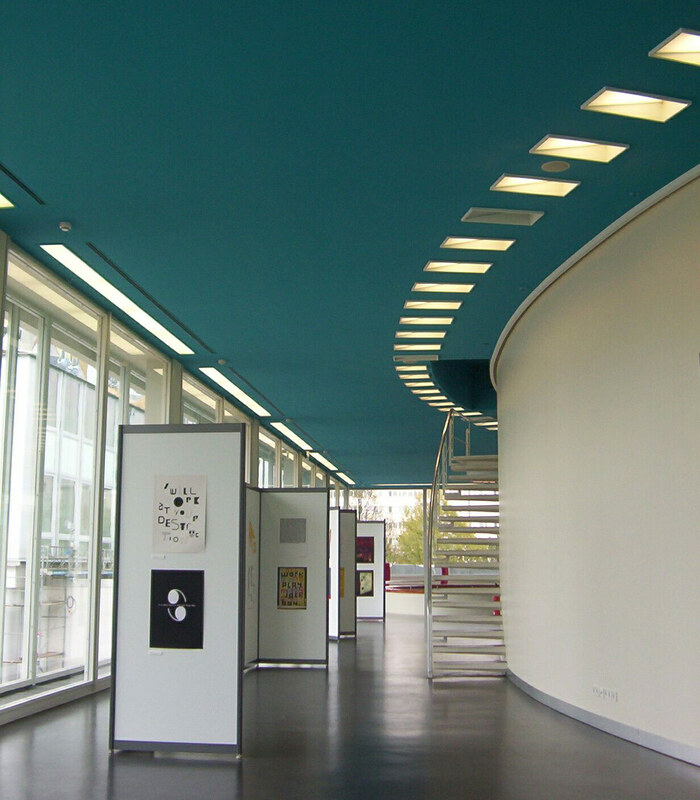 Although we were in Berlin, too – we had to rely on Angharad Lewis to take decent pictures of the exhibition that we show here with her kind permission. Memorable speeches are those that elicit a response in the listener. Whether they are political, cultural, serious or light-hearted, the resonance of the words bears a relationship to the delivery of the orator. It is the charisma, body language, tone of voice and personality of a speaker - as well as the message itself – that makes a speech momentous. It is exactly the same elements in visual form, that make successful typography. 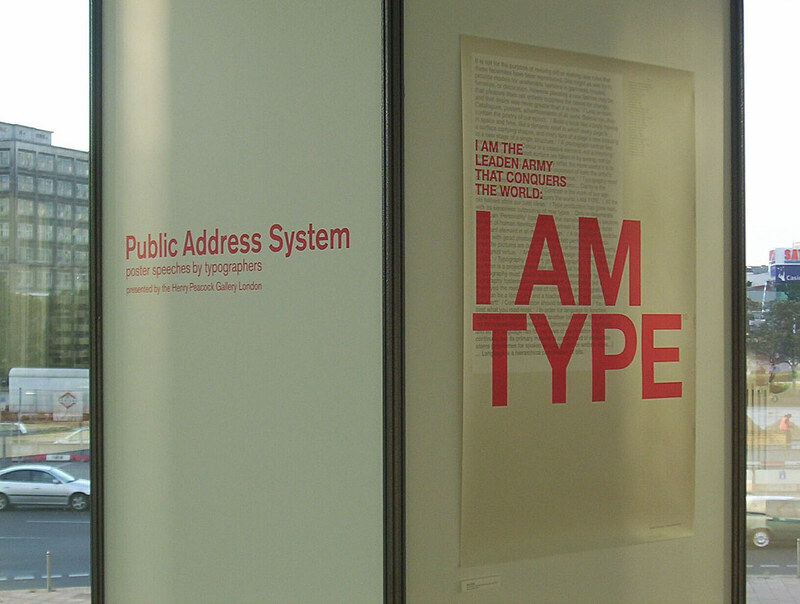 The posters in this exhibition reflect the creative and expressive powers of typography. It brings together a comprehensive collection of designers and typographers that represent the spectrum of contemporary typographic practice. For the uninitiated the word typography might evoke dry, technical, laborious associations, but this show proves what a richly expressive medium it is. Typography is an essential part of graphic design. At its heart, graphic design is the union of words and images, and the way those words are designed is crucial to the communicative powers of design. ___ The posters in Public Address System have been created by some of the world‚s leading graphic designers. Innovators of the pre digital era such as Derek Birdsall and Alan Kitching; Pentagram partners Angus Hyland, Fernando Gutiérrez and Justus Oehler who thrived in the new technological age; and today's young innovators and rule breakers like FL@33, Experimental Jetset and The Designers Republic, have all contributed to this unique exhibition of typographical design. Today, typefaces are busy doing the job of communicating messages in almost every conceivable modern space – with quiet ease on the pages of novels, shouting thunderously from moving screens in the world's capitals and communicating efficiently on road safety signs. Typography has existed since humans first made marks on the walls of caves to express themselves and has evolved as an art alongside human history. Many typefaces have strong associations with particular eras, products and services that most people aren't aware of until they make the association for the first time (after which it is impossible to stop noticing the way typefaces work). A famous example is the London Underground typeface, designed by Edward Johnson in 1916. It provides such a successful visual backbone to the whole of London Underground that it goes unnoticed in situ, but is instantly recognisable out of context. The most immediate experience of typography for most people today is the fonts they use to write documents on their home computer. But typographically speaking this is a drop in the ocean. Any place that words appear - books, magazines, packaging, signposts, web sites, advertising hoardings, television screens – are the concern of the typographer. Traditionally, posters and speeches jostle together in the arena of public protest. 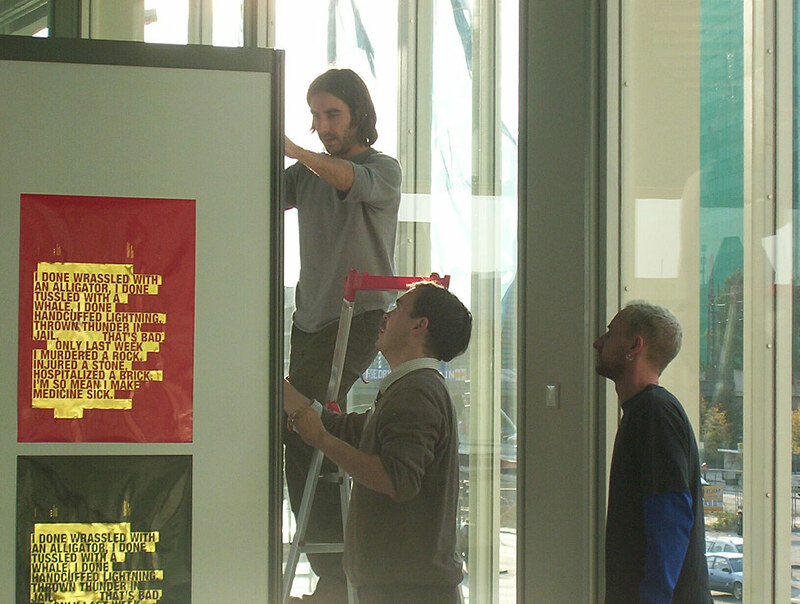 Many of the speeches that have been interpreted for this exhibition are of a political nature and the posters inspired by the words of politicians and orators bring together the audio and visual aspects of the protest march, a familiar experience in recent times. Designer and critic Paul Rand said "typography is an art. Good Typography is Art". This exhibition celebrates the beauty of typography and the resonance it has as a means of communication. It showcases the very best talent from the international design community.